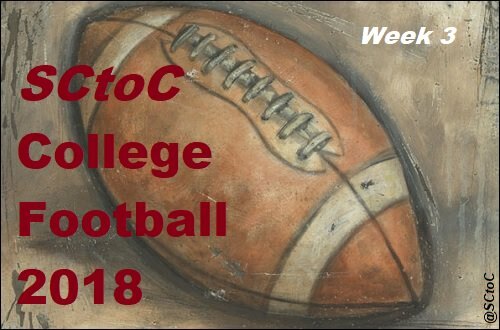 Welcome to SCtoC's week 3 coverage of the 2018 College Football Season. What: The Aggies make their way up to the South Bay to face the Cardinal. When: Saturday, Sept. 15 at 11 a.m.
2018 Records: Aggies 2-0 (0-0 Big Sky); Cardinal 2-0 (1-0 Pac-12 North). Head Coaches (overall as HC): Aggies - Dan Hawkins (119-67-1); Cardinal - David Shaw (75-22). Note(s): Jake Maier completed 50 percent of his passes for 302 yards and a touchdown in the Aggies' 54-21 home win over San Diego in week 2. Freshman running back Ulonzo Gilliam rushed for 69 yards and three touchdowns, and Jared Harrell caught eight passes for 81 yards and a score in the win. The Cardinal rode their defense to a 17-3 win over USC in week 2. K.J. Costello hit 16 of 27 of his passes for 183 yards and a touchdown, while Bryce Love rushed 22 times for 136 yards and a score. Tight end Kaden Smith led Stanford with four receptions for 77 yards in the win. What: The Broncos head to the Midwest to face the Cowboys. When: Saturday, Sept. 15 at 12:30 p.m.
Where: Boone Pickens Stadium; Stillwater, Oklahoma. Note(s): Brett Rypien completed 75 percent of his pases for 362 yard and three touchdowns in the Broncos' 62-7 win over UConn in week 2. Alexander Mattison rushed 11 times for 115 yards and two scores in the win. Wide receivers John Hightower each caught a touchdown pass and tallied 119 and 100 receiving yards, respectively. After dispatching Missouri St., 58-17 in the season opener, the Cowboys routed South Alabama, 55-13, in week 2. Taylor Cornelius went 25 of 40 for 428 yards with a touchdown and a pair of picks in the Cowboys' win over South Alabama. Tylan Wallace had 10 catches for 166 yards and a touchdown, and Tyron Johnson hauled in five passes for 137 yards in the win. This is the first of two straight weeks in which the Broncos will face a team of Cowboys. They face off against Wyoming in week 4. What: The Ducks close out their non-conference schedule at home against the Spartans. When: Saturday, September 15 at 2 p.m.
Radio Stream: Ducks - 750 The Game. Head Coaches (overall as HC): Brent Brennan (2-13); Ducks Cardinal - Mario Cristobal - (28-48). Note(s): This is the second straight week the Spartans will face a Pac-12 North team as part of their non-conference schedule; they were blanked by Washington St. in week 2, 31-0. Montel Aaron went 13 of 25 for 94 yards and Josh Oliver caught five balls for 51 yards in the loss. Quarterback Justin Herbert has looked good thus far in non-conference play. he completed 77 percent of his passes for 250 yards and four touchdowns (to four different receivers) in the Ducks' 62-14 win over Portland St. in week 2. Tony Brooks-James and C.J. Vardell rushed for 107 and two touchdowns, and 100 yards and one touchdown, respectively, in Oregon's win. What: The Vikings welcome the Yotes for their home opener. When: Saturday, September 15 at 2:05 p.m.
Radio Stream: Vikings - Rip City Radio 620. Head Coaches (overall as HC): Yotes - Mike Moroski (N/A); Vikings - Bruce Barnum (12-24). Note(s): Yotes' head coach Mike Moroski played eight seasons as a quarterback in the NFL. In his final season, with the San Francisco 49ers, he threw one of Jerry Rice's record 197 touchdown passes. Quarterback Darius Peterson threw for a touchdown and an interception in the Yotes' 35-28 loss to Southern Oregon last week. He also rushed for 69 yards and two scores. Jabari Eason threw for 111 yards and a touchdown in the Vikings' 62-14 week 2 loss to Oregon, but it's likely we see Davis Alexander under center for this game. Tight end Charlie Taumoepeau, who has four touchdown receptions on the season, is bound to be on NFL scouts' radars after hauling in five passes for 125 yards and two scores against the Ducks. The Vikings are looking for their first win in more than a year. What: The Golden Bears look to go 3-0 on the season as they visit the Cougars. When: Saturday, September 15 at 3 p.m.
2018 Records: Bengals 1-0 (0-0 Big Sky); Bears 2-0 (0-0 Pac-12 North). Head Coaches (overall as HC): Bengals - Mike Phenicie (5-7); Bears - Justin Wilcox (7-7). Note(s): Running back James Madison rushed 19 times for 114 yards and three touchdowns in the Bengals' 45-10 season-opening win over Western State Colorado two weeks ago. Tanner Gueller threw for 213 yards with a touchdown and an interception and his brother, Mitch Gueller had four receptions for 81 yards and a score. The Golden Bears withstood a BYU comeback last week and emerged with a 21-18 win. Chase Garbers threw for 176 yards with a touchdown and an interception in the win. Brandon rushed for 74 yards and a score. Kanawai Noa and Patrick Laird each caught seven passes and a touchdown with 93 and 53 yards, respectively. Just into his second season, head coach Justin Wilcox can move to 6-0 in non-conference games with a win. Twitter: Bengals * Golden Bears. What: The Eagles and Cougars renew their regional state rivalry in Pullman. When: Saturday, September 15 at 5:05 p.m.
2018 Records: Eagles 2-0 (1-0 Big Sky); Cougars 2-0 (0-0 Pac-12 North). Head Coaches (overall as HC): Eagles - Aaron Best (9-4); Cougars - Mike Leach (124-81). Note(s): Gage Gubrud completed 18 of 33 passes for 322 yards and four touchdowns in the Eagles win at Northern Arizona last week. Nsimba Webster was on the receiving end of three of those scores to go along with his seven receptions for 176 yards. Sam McPherson rushed 22 times for 161 yards in the win. The Cougars are riding high after disposing of the San Jose Spartans, 31-0, in week 2. Gardner Minshew completed 34 of 51 passes for 414 yards with three touchdowns and a pair of interceptions in the win. Travell Harris had six catches for 83 yards and Davontaean Martin caught six passes for 68 yards and two touchdowns. Portland St. may get their first win since 2016. They lead College of Idaho, 28-7, with 38 seconds left in the first quarter. My neighbor just yelled "Yeah Viks!" I salute him for his loyal fandom. Congratulations to Portland St! Oh yeah, and Cal is up 28-9. I'm turning over the updates to Heidi. Congrats to Stanford, Portland St. and Oregon on their wins! Justin Wilcox is about to go 6-0 in non-conference games. Cal leads Idaho St. with 8:04 left in the fourth quarter, 45-9. Not looking good for the Eagles early in the 2nd. Down 21-3.